We first saw the Lenovo IdeaPhone S890 at CES 2013, and now it’s one step closer to arriving and we get to check it out at Mobile World Congress. 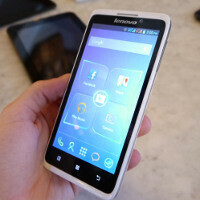 The Lenovo S890 is an affordable 5-inch Android device. Affordable is the key word that will explain many of its shortcomings - the screen is of the IPS kind with nice viewing angles, but it is of only qHD (540 x 960-pixel) resolution. True, we got spoiled by all those flashy new devices! Driving performance is a dual-core MediaTek processor, another compromise that has been made to lower the price. Overall, the device definitely looks and feels cheap. We got to check out the white glossy plastic version which caught fingerprints easily on the back. The Lenovo IdeaPhone S890 will also be available in blue and black. The S890 is fairly thin, but on the heavy side and you’d definitely feel the heft in your pocket. Priced at under $350, the Lenovo S890 will compete with devices like the Samsung Galaxy Grand, and it has got its price as a headstart. It's actually already sold here in the Philippines, probably just last week. For a reasonable price, too. here in ph the price is 12k php.